A great weekend back in Banbury. Julie and Barry popped into see us on Saturday afternoon. We heard all about their wonderful cruise and their stay with their son Ben and his new wife Laura in Miami just before Christmas. Also caught up with progress at the boatyard on the Thames that Barry is managing. Later on that Saturday afternoon Paul and I joined fellow Banbury boaters Si and Kaz and Gary for a drink in the pub, followed by a curry supper on Nene Pilot (Si and Kaz’s boat). 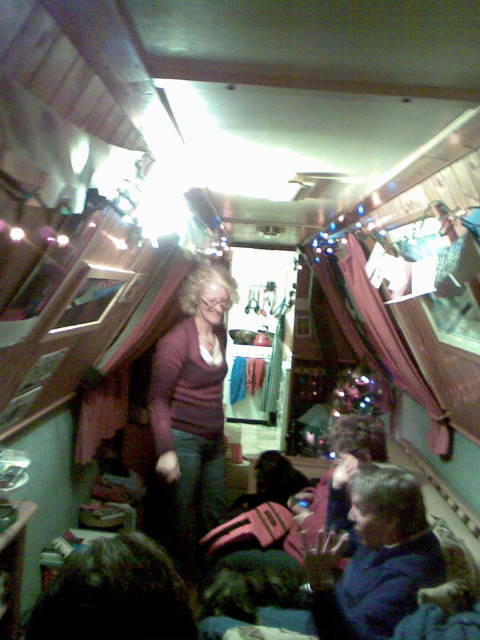 The boat looked very festive with a tree, lights and decorations. Kaz and Si’s 2 dogs settled down on the sofa with us and we felt right at home. Simon prepared a tasty chicken curry (thats it hiding under his t-shirt, Gary has spotted it). I did something with Aubergines and split peas and Paul did a fish curry. All a bit hot and spicy, but the wine was flowing so it seemed to go down OK. Kaz brought out the cheese and Port to finish the meal. What a great evenin! And we made it to bed about 12.30 (us oldies at 50 cant stay up much later than that, we need our rest!). 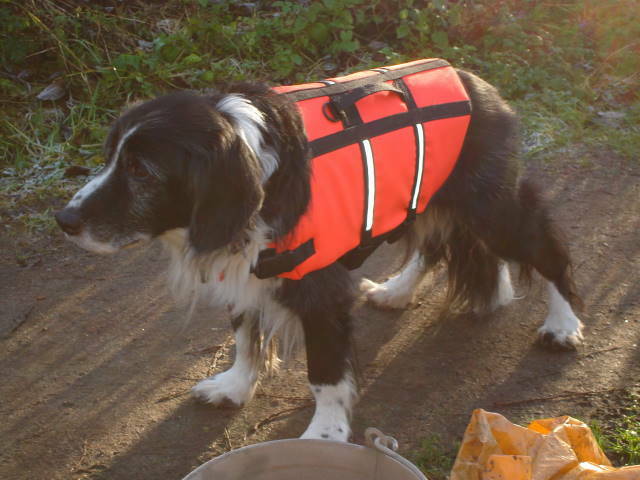 Oh nearly forgot, but a big thanks to Kaz for finding an aid for Roly…..
……..its a rather fetching doggy life vest, and will hopefully help him stay afloat should he decide to fall in the canal again. Note the handle for lifting him out. 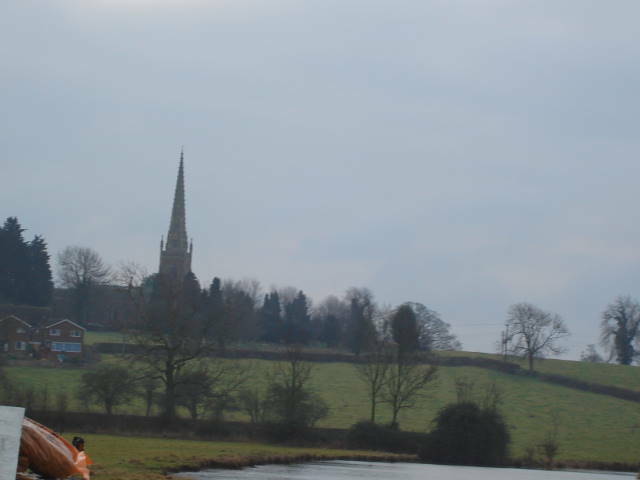 …….to moor up for the night near Priors Hardwick. This is a nice bit of towpath with piling before going across the windy Fenny Compton stretch. Unbeknown to us Brian and crew on Harnser were moored just around the corner. During the night, about 1.30am I was off the boat with Roly having a widdle (thats Roly not me). I turned back to the boat to lift the cratch cover when I heard a loud splash – Roles had somehow managed to topple into the canal. He struggled to keep his head above the water, and his ‘head tilt’ meant he was only able to swim in circles, ever further from the bank. With a desperate lunge, clutching onto the boat, I managed to catch his collar and drag him to the side. One last heave of collar and clutching his coat by his tail I managed to get him out. Three towels, one soaked dressing gown and a hot cup of tea later we were snuggled up, back on the boat in front of the fire. Poor old Roly, not very dignified and a bit of a cold shock to say the least. The next morning Paul had us up at 6 am again and we battled on through a cold grey morning on the final stretch to Banbury. This morning, I hope you were enjoying a nice lie in after an enjoyable, though heavy night of drinking and frolics to welcome in the New Year – not Paul and me though. Oh no! 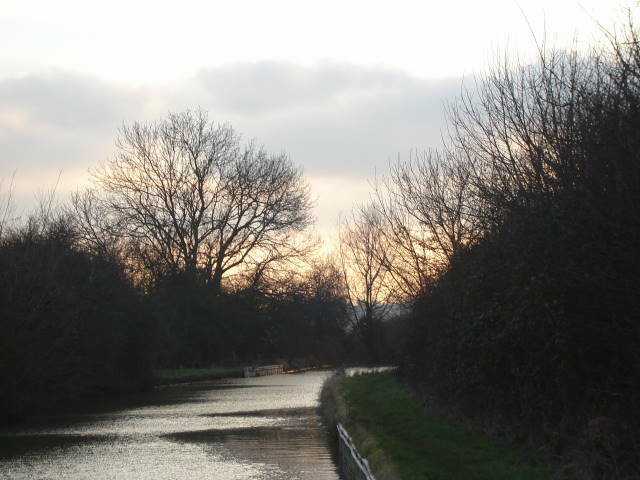 Paul had us up bright and early at 6.00am for a quick getaway up the Atherstone flight of locks, in the dark. I’m told there is reason for this madness, we are trying to get back to Banbury before the blizzard, forecast for the end of the week, sets in. No sign of it yet thank goodness, it was really mild today and the sun even broke through. A few more boats about this week, quite a few of them hire boats. Such a shame, I was getting to feel that we owned the canal system. Well arrived in Rugby at 5ish and moored outside Tesco. Paul was surprised to find that the store wasn’t open when we got there, in fact the staff had been allowed the whole day off and wouldn’t be back manning the tills ’til tomorrow at 8am. What a cheek, that’s far too late for us early starters. Anyway the upshot of this is that we have run out of Earl Grey Tea so he will have to make do with ordinary tea. You are currently browsing the Daniel Oakley blog archives for January, 2008.